Spirit Lake Motorsports has a brand new 2019 Triton AUT 1482, Open Deck Aluminum Trailer 82" x 168" box size, for sale, MSRP is $4,593. NOW Priced $4,164.00 this includes our fees. The AUT line of all aluminum utility trailers is designed with the utmost precision to give you years of trouble-free service. With features like a bi-fold ramp, and adjustable tie-down positions, you can be sure every detail has been crafted to meet the unique needs of large equipment, landscaping material, and commercial goods hauling. Great for hauling Polaris Rangers, RZR's and much more. 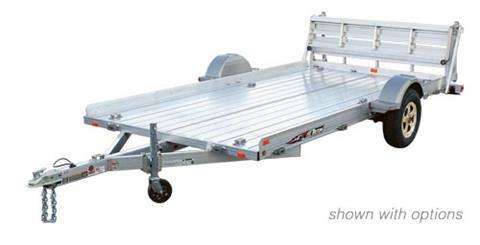 Aluminum loading ramp has four aluminum hinges providing superior support across the entire ramp. Quality coupler with steel safety chains and spring loaded clips for ease of use, strength and safety when you need it the most. Lanyards keep the ramp pins with the trailer. D-ring or Bracket tie downs providing unlimited adjustability for safe and secure hauling. Straight or less wind resistant bi-fold aluminum ramp. Five year limited warranty when registered online. Please feel free to email or call for details. We have financing if needed. We are always here to help. Come to Spirit Lake Motorsports today to take a look! We can deliver for a small fee. Polaris has some great financing offers. *Price valid for Cash or Standard Financing deal, with qualifying credit. Tax not included in above pricing. COLORADO REQUIRED DISCLAIMER: One Unit only. Rates and terms subject to change. We will be closed from April 28th - May 6th. Reopening on May 7th. Without Brakes - 2,995 lbs. With Brakes - 3,500 lbs. Without Brakes - 2,135 lbs. With Brakes - 2,640 lbs.